Friends, Drummers, Juicers… Blenders! Glad you've come to check in with this blog again and I truly hope this finds you well. 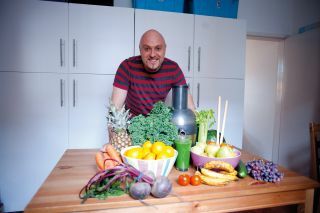 It's been a breath of fresh air getting positive feedback from like-minded drummers about their healthier food/liquid choices… seems "rock'n'roll" is slowly turning a corner of the clichés - or at least, people are stopping to think and get a healthy balance. In this blog, I'm exicted to introduce another guest drummer who's 'pocket' is as deep as his lifestyle for Good Health… His credits are a 'who's who' of the world 's top selling artists including Alicia Keys, Katy Perry, Avril Lavigne, Britney Spears, Chaka Khan, Pink, Cher, Celine Dion, Ke$ha, Will Young, Leona Lewis, Kelly Clarkson and many more. We've also both shared live drum duties for the great Annie Lennox (him doing pre-2003 shows). Friends, a warm welcome to drummer, programmer, producer, writer, remixer STEVEN WOLF ! "I got into eating healthy in the late '80s. I was still at Berklee, and I injured my hands badly, and was told by a hand specialist (western doctor) I would have to give up drumming. As you can imagine, as a young drummer, I was devastated. My friend Fuze (David Fiuczynski) told me I should check out an alternative healer, named Richard Zukowski, who had helped him with his hands. At that time, alternative medicine wasn't as widely as accepted as it is now, so Fuze told me to go with an open mind. "Aside from working on my hands, the healer asked me about my diet. I was like, 'What does my diet have to do with my hands?' I grew up eating a typical American junk-food diet… and I'd never made the connection between diet and health before. He explained that my hands would have a better chance at healing, if my whole system were healthier. I was skeptical, but desperate to be able to continue drumming, so I gave it a shot. "It was a radical step for me. I changed my diet completely… giving up everything I was used to eating: sugar, dairy, red meat, refined grains, etc.Long story short, as soon as I made those changes, my overall health improved dramatically, which was an unexpected bonus… as I originally went to him because of my hands. "I've aged extremely well since then, and it's mostly because of my diet.As far as my hands: he helped me to be able to drum again, and within a year, I went from being told I'd have to give up drumming to being on the road with a major label artist, and have gone on to have a great career in music.My hands still hurt when I play - that will probably never go away - but I can play, and that's all that matters. "My diet is mostly greens (spinach, kale, etc), so I generally don't juice greens, aside from wheatgrass shots. My juice of choice is usually some variation of carrot, apple and ginger. My favourite variation of this is one of Liquiteria's specials called 'Mr Green'. It's not really a green drink, as the name would imply (that would be their 'All Greens'). Mr Green has a greens powder blended in, but it's not a proper greens juice. The ingredients are: carrot, apple, beet, ginger, Super Green Food (greens powder) and Liver Kidney Lymph Detox (tincture). "It's f**king delicious. They make a traditionally juiced version, and they also have a pressed version. Pressing gives you more nutritional content… and it's convenient for me, because they do bottles of their pressed juices. I always keep at least one bottle in my fridge. I drink others from the list too, but Mr Green is my go-to juice. "The other thing I like to drink a lot is some sort of banana smoothie. My favorite type of banana smoothie is 'The Elvis', which is a peanut butter and banana smoothie. "I don't use specific measurements… I just eyeball everything. I use about 3 parts water to 1 part hemp or almond milk, 1-2 bananas, depending on the size, and a big glob of peanut butter. Occasionally, I'll skip the water, and use just almond or hemp milk, if I want an extra creamy version. Also, a healthier variation is with almond butter instead of peanut butter. Almonds are more alkalizing than peanuts. That being said, it's so much yummier with peanut butter, so that's my preference, unless I'm on a cleanse."